In initial days Computers were demon – occupying so much of space – those who could use it would threaten everybody else… and people had to remove their footwear when entering computer rooms !!! … IBM sold the first IBM PCs in configurations with 16 or 64 kB of RAM ~ "IBM Personal Computer XT", IBM's model 5160, was an enhanced machine that was designed for diskette and hard drive storage, introduced two years after the introduction of the "IBM Personal Computer". It had eight expansion slots and a 10 MB hard disk (later versions 20 MB). Life has come a very long way …. Ordinarily mobiles come with a 4GB memory card !!!! Even at this age, most offices do maintain physical files – a well prepared one might look like this on its sides……… yes, containing yellow stickies, indicating the more important pages – making identification easy. Stickies – sticky notes - Post-it notes are pieces of paper stationery with a re-adherable strip of adhesive on the back, designed for temporarily attaching notes to documents and other surfaces. They are now available in a wide range of colors, shapes, and sizes - most commonly they are 3-inch (76 mm) square, canary yellow in color. 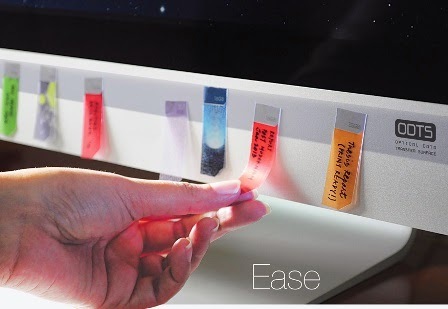 A unique low-tack adhesive allows the notes to be easily attached and removed without leaving residue. Post-it notes were invented by 3M's Art Fry, using an adhesive developed by a colleague, Spencer Silver. Until the 1990s, when the patent expired, they were produced only in the 3M plant in Cynthiana, Kentucky. Although other companies now produce sticky or repositionable notes, most of the world's Post-it Brand notes are still made in Cynthiana. The term "Post-it" and the canary yellow color are registered trademarks of 3M. "Sticky Note", likewise, is a trademark of Société Bic. Generic terms for competitors include "repositionable notes" and "repositional notes". Spencer Ferguson Silver an American chemist together with Arthur Fry, invented Post-it notes in 1970. Working on modern day svelte computers gives you greater confidence and makes you feel happy…….but there are times when you struggle transporting data … again life is on faster track from the old 1.44 floppy disks to 700 MB CDs to 4 GB DVDs to minisized multi GB thumb drives … you have them all .. still for some finding the USB port and transferring it is arduous… and how good it would be if saving data on the media is as easy as sticking a note on the screen ? 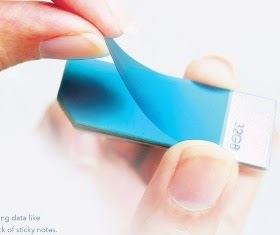 ……… that is a near possibility … design of paper-thin, sticky memory cards. Proudly Indian Designers Aditi Singh and Parang Anand theorize that a single layer of graphene sandwiched between two flexible protective layers could provide up to 32GB of storage space. A sticky edge would carry data from an optical data transfer surface conveniently built in to the edge of your computer monitor. As of date, it is completely theoretical and in no way buyable, but it's a nice dream. Graphene is a wonder material, to be sure, but graphene-based consumer products are still a long, long way off. According to their website ‘datastickies.com’ - dataSTICKIESTM is a design concept for graphene-based flash drives that may replace USB data drives in the future. USB-based drives can be inconvenient to use as the positioning and insertion of the drive in the USB slot needs to be done precisely. When the slots are at the rear of a device, as is the case for many desktop computers, this task becomes even more troublesome. The new idea is envisaged to solve this problem by carrying data like a stack of sticky-back notes. Each of the dataSTICKIESTM can be simply peeled from the stack and stuck anywhere on the proposed ODTS (Optical Data Transfer Surface), which is a panel that can be attached to the front surface of devices like computer screens, televisions, music systems, and so on. The special conductive adhesive that sticks the dataSTICKIESTM to the ODTS is the medium that transfers the data. This special low-tack, pressure-sensitive adhesive is capable of being reused without leaving marks like a repositionable note. When the dataSTICKIESTM are being read by the device, their edges light up. The product is conceptualised to come in various colours and patterns that make data segregation according to type and size easier. They can be stacked and used together for increased capacity which also enables carrying them together. According to them, the new concept provides an opportunity to bridge the virtual world and the physical world. Digital data becomes easier to associate with, as it can be integrated with the physical objects it relates to. 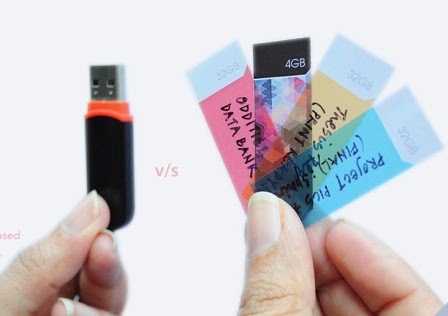 So, it would be ‘from Data-Sticks to data-that-sticks: the “dataSTICKIESTM”!’… One day, the brainchild of designer Aditi Singh and university professor Parag Anand, both from New Delhi would make USB drives obsolete.